After the frankly fantastic playable teaser for Resident Evil 7 a lot of people had high hopes that the once scary zombie fighting series was about to get back on track. While Resident Evil 4 is an astounding game it really did herald in the age of action over survival, with Resident Evil 5 being a copy of that format, and Resident Evil 6 being a bit of a mess (that I admit I am quite a fan of regardless). 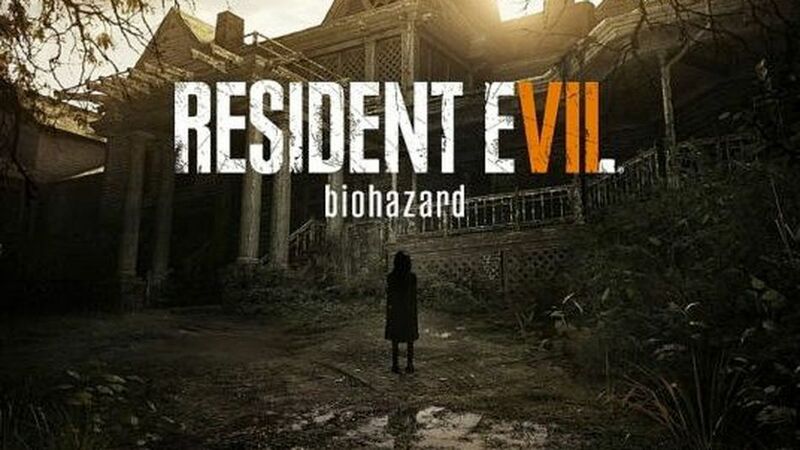 So with the promise of a return to just what made the games originally great in the first place; namely survival horror, and almost a soft reset of the very convoluted over arching plot there was much for this new entry to live up to. I played through the entirety on the game using PSVR, I would strongly suggest if you have access to that then that is how you should play through the game also. While the graphics take a slight hit the level of immersion is at times mind blowing, I can honestly say that the scares this game gave me eclipsed anything I had previously felt in both games and movies. At times I literally shouted out in fright, there was one occasion where for about half an hour after the initial jump by heart was still beating furiously! Also during one sequence where I had to sidle down a narrow corridor with giant millipedes crawling all around me I actually had my skin crawl; a first for video games. The other parts where VR really improved the experience was the aiming of guns, here you use your head to aim which felt weird and first but soon become second nature (as is far easier than aiming with the controller). My favourite mechanical part of using VR was the ability to peak around corners, made parts such as the few stealth sections all the more involving. 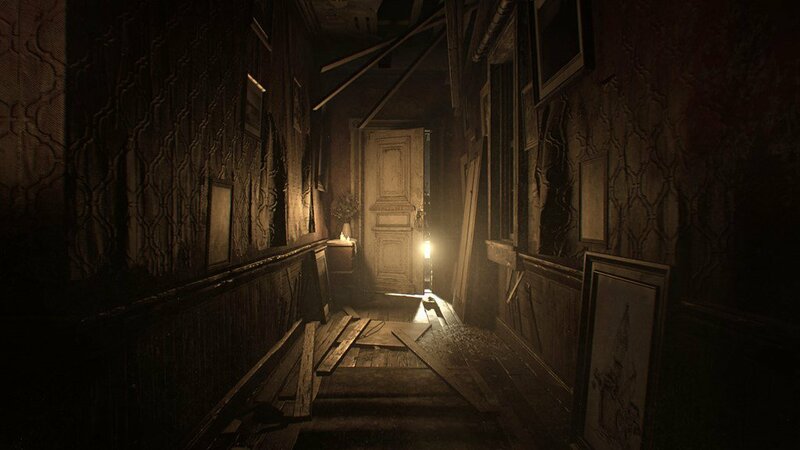 Resident Evil 7 if I had to compare it to any other one in the series would be the original game. Much of this takes place in the large Baker plantation made up of a mansion and several other buildings, all full of (simple) puzzles, secret passages, safe save rooms, locked doors that require specific keys, and sparse combat against well designed monsters. This is real survival with ammo and health never found in large amounts, and a well crafted sense of being out of your depth. It felt at times quite old school in the way it plays but this was more often than not very welcome with some neat modern additions to smooth things over. Contrivances to remove useful weapons and to set up story beats were obvious, but other additions such as making crafting additional ammo and health yourself via the use of chemicals was pretty cool. Towards the end of the game Resident Evil 7 does loose some of this survival feeling when it goes a little too action focused, which I blame entirely on the acquisition of a machine gun. Also the later locations never come close to replicating the intricately designed plantation, or the scares that constantly haunt you there. So yes, this is one scary game. In truth many of these are jump scares, I don't know how effective they would be in non VR, but they never failed to elicit a response from me when they are there in front of your face. What I loved was how un-telegraphed these jumps were. You could walk down the same corridor a hundred times only to have a screaming nightmare leap out in front of you, or burst in from a window once you had gotten to a certain point in the game. It is impressive how many different horror games Resident Evil straddles without ever seeming like it is copying what has come before. 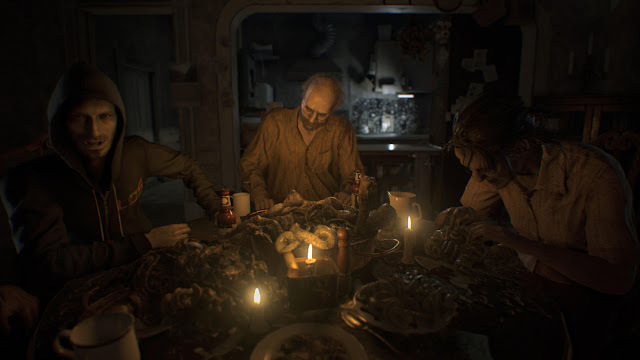 The first third of the game (after a very Evil Dead feeling prologue set in the house of the demo) feels almost like Outlast with guns, you are being stalked by the Baker family (father Jack, mother Marguerite, and son Lucas) with them bursting through walls, and showing up where you would at least expect them. While guns do give you the power to temporarily stop them they soon come back to chase once more. My main complaint of Outlast was the inability to do anything but flee from your pursuers, so it felt refreshing to be able to deal with them this way. Once you have gotten a few new weapons things take on a more familiar Resident Evil vibe, slow moving enemies who are unable to use doors echoing the zombies of the old games. It was here I discovered just how empowering using a shotgun in VR could be! There is even a section of the game that felt like a mash-up between Silent Hill and Fatal Frame/Project Zero, a tense, nail biting sojourn through the darkness of a child's nursery that gave me a genuine feeling of creeping dread. Later on more changes are made, with events going more into F.E.A.R territory via Doom 3. While this part was also scary at times, it just wasn't as remotely effective as the games first half. The fact that Resident Evil 7 pays homage to all these styles of horror while still feeling cohesive is a testament to the tight game design. As stated there is a lot less fighting to be found here, it is good then that the key antagonists have so much personality to them. A scene lifted straight out of The Texas Chainsaw Massacre introduces you to their different quirks, then you are set up against them. Jack is the powerhouse of the three, able to burst through walls and with great strength. The sections involving around Marguerite are more about evasion, she has the ability to summon giant locusts to attack you, her whole segment takes place in an insect infested building. Spiders and flies swarm over walls and doors, while other non hostile ones crawl everywhere. This part of the game for me was the most unsettling as I really do not like bugs! Lucas meanwhile has more of the intelligence about him, his parts revolve around booby traps such as trip wires, and various other onstacles used to hurt you. Aside from these villains (and the insects) the core enemy type you face are humanoid looking black oily looking monsters called 'the molded'. There are about four different types of these creatures, and they are frightening in the way they can just rise up out of solid ground (especially as being in first person you cannot see all around you). 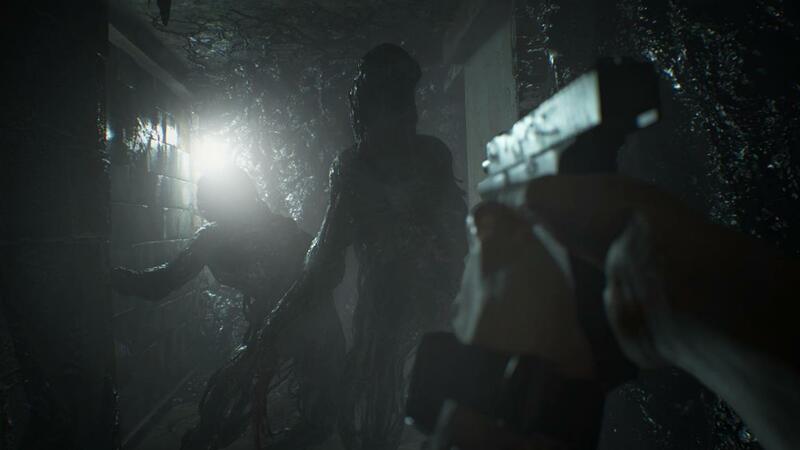 I loved them for a lot of the game, however again going towards the games end I did wish there had been some different enemy grunts to face as they became just a little too overly familiar, loosing a lot of the effect they first have when you encounter them in the basement. As well as these there are plenty of boss battles which for the most part are fun to do if a little simple. Usually you will find yourself locked in a room and just have to shoot and shoot and shoot until your grotesque attacker is killed in a suitably violent way. Resident Evil 7 is very violent which was a lot of fun to see. There is a lot of body horror here with limbs cut off, decapitations (including one via a shovel! ), stabbings and self torture. Much like Outlast your character has some nasty things happen to him such as a screwdriver through the hand and immolation, while some of the death scenes are very gory. Early on I remember getting killed thanks to a chainsaw to the stomach that was very strange to experience in VR! The sound design for this is top notch, being first person it is so effective to hear noises all around you, I lost count the amount of times I span around only to find out something such as a slamming shutter was the cause and not a being from hell. There isn't much music in the game when you are just wandering around, but it turns up when there is horror afoot, the silence in the down times helped build up the atmosphere, and when there is music it fits the tone very well. The plot isn't bad, things eventually get explained, I felt the English voice actor for Ethan wasn't great, he just never seemed that bothered about Mia, other characters fare much better, the three family members in particular are all memorable. One way of showing back story was by the use of videotapes. Playing these would send you back in time to play a segment as a different character, usually sending you to locations Ethan had not yet visited, and revealing clues to help you when you do get there. The very best of these was a video of a man trapped in a Saw style torture room, it was so much fun to play through, and had a fantastic pay-off for when Ethan later discovers this place. I could talk all day about Resident Evil 7 so I will wrap things up here. Simply put this is a near master class in horror games, let down only by a less interesting second act. It is so well designed, and there is so much confidence on show here that this really is a return to form for the series. The first person perspective adds so much, put on top of that very effective VR and you have a real thrill ride that is guaranteed to make you jump. I shall be keeping an eye on the soon to be released DLC to see how that pans out, but for now, if you at all like horror in your video games this is an essential purchase that you wont regret.